If you like Apple you should also like Broadcom. Semiconductor maker Broadcom (AVGO - Get Report) is a supplier of computer chips to Apple (AAPL - Get Report) and the two stocks have had similar chart profiles, which makes Broadcom a stock to buy on weakness, given the positive technical charts for Apple. Tuesday is a big day for Apple as the iPhone maker announces its latest product innovations at its consumer technology event. The hype focuses on the anticipation that Apple will unveil its most sophisticated iPhone in years. This should allow shares of Broadcom to recover from a modest post-earnings decline that occurred after positive earnings were released on Aug. 24. Broadcom has been above a "golden cross" on its daily chart since Dec. 21, 2015 when the stock closed at $145.80. Apple has been above a "golden cross" since Sept. 6, 2016. By this measure, Broadcom has led Apple. A "golden cross" occurs when the 50-day simple moving average rises above the 200-day simple moving average and indicates that higher prices lie ahead. This is the daily chart indicator that supports the strategy to buy shares of Broadcom on weakness to value levels. Broadcom and Apple have similar performance measures. Apple has a gain of 39.4% year to date and is 55.2% above its post-election low of $104.08 set on Nov. 14. Broadcom has a gain of 40.1% year to date and is 54.2% above its post-election low of $160.62 set on Dec. 2. Apple has a positive weekly chart, but Broadcom does not, because Broadcom declined 7.5% from its pre-earnings high of $259.36 set on Aug. 24 to its Aug. 29 low of $240.03. Broadcom ended last week with a negative weekly chart, but this chart could be upgraded to neutral or positive this week given a close on Friday above its five-week modified moving average of $246.76. The 12x3x3 weekly slow stochastic reading is projected to end this week at 65.66, which is just below the Sept. 8 reading of 66.01. 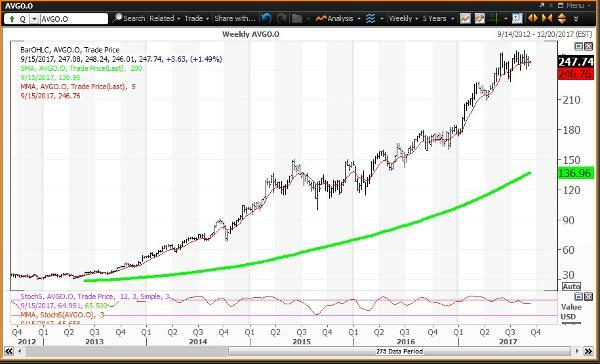 If momentum rises above 66.01 with a close above $246.76, the weekly chart will be upgraded to positive. Investment Strategy: Buy weakness to my weekly value level of $245.87. The Aug. 29 low of $240.03 is the second buy level. My semiannual value level is the third buy level of $233.30. Sell strength to my semiannual risky level of $284.01, which would be a new all-time intraday high.